Want to get into the habit of eating delicious and healthy organic food every week? Abel and Cole veg boxes are a great way to get started in good eating. And with an Abel and Cole promotion code, you can experience the benefits of fresh, seasonal food without spending a fortune. Whether you want all your favourites or a gourmet box packed with exciting new things, an Abel and Cole voucher lets you eat well for less. One of the forerunners of the fashion for veg boxes delivered to your door, Abel and Cole started life in 1988 when one of the founders started a business buying potatoes in bulk and selling them to his neighbours door to door. From there, the company become aware of the many issues and dangers associated with the pesticides and chemicals sprayed on commercial crop, and decided to focus solely on supplying organic products to its customers. Today, Abel and Cole is the vegetable box supplier of choice for thousands of customers across the UK. Working directly with the best farmers, growers and producers throughout the country, Abel and Cole supports organic farming as encouraging biodiversity, protecting the countryside, improving animal welfare and supporting local communities. All of their vegetables, fruit, dairy, bread and wine comes from Soil Association certified suppliers who stick to a strict code of conduct, while their meat and poultry comes from just a handful of farmers dedicated to the health and welfare of their animals and producing ethical, sustainable and high quality meat. Abel and Cole are against food waste, donating any leftovers to local charities, and use sustainable packaging to minimise the ecological impact of their delivery service. The company aims to encourage people to eat seasonal and organic produce, helping them to simultaneously improve their diets and cut down their household food budget at the same time. Customer at Abel and Cole can take their pick from a wide range of veg boxes and groceries available to order from their online shop. Choose from combined vegetable and fruit boxes, juicing boxes, meat boxes, complete recipe boxes, gourmet boxes, fresh baked bread, dairy and eggs, organic wine and much more. Once you know what you want, you simply set up and account and arrange with your regular driver a suitable place for your box to be dropped off – and your empty box collected – every week. Want to try Abel and Cole for yourself? Using an Abel and Cole voucher is a great way to sample the delights of organic veggies on the cheap. Whether you want a weekly box of gourmet ingredients to give you cooking inspiration or a large box with enough fruit and vegetables to feed the family for a week, an Abel and Cole discount code will let you save money while you shop. Browse our website to find an Abel and Cole voucher that suits you, then navigate to their website to begin shopping. Pick a product then click 'Add to basket' to order. Fill in your details and click 'Next'. Enter your Abel and Cole promotion code where applicable. Want to find out more about what's happening at Abel and Cole? THen head on over to their YouTube channel! You'll find great video recipe guides, features on organic farming, interviews with Abel and Cole farmers and producers and more. You can also use the channel to learn more about saving money with an Abel and Cole voucher. Enter your Abel and Cole voucher where applicable. Enter your payment details and click 'Next' to place your order. Want to stay up to date with everything that's going on behind the scenes at Abel and Cole? The company maintains a presence across all your favourite social media platforms. Follow them for access to exclusive recipes, seasonal food tips, dinner party planning ideas and more. Don’t forget to check them regularly, as you can never be sure when a free Abel and Cole voucher might be waiting for you! Buy now online at www.abelandcole.co.uk/. 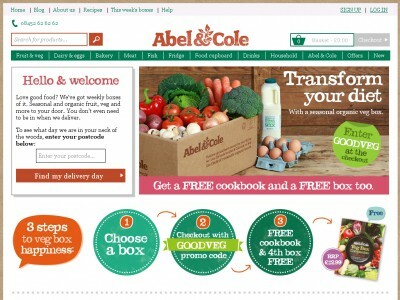 Abelandcole.co.uk is a great place to shop if you’re looking to find healthy organic foods at a great cost. By using an Abel and Cole voucher or an Abel and Cole promotion code, you’ll be able to save money on fresh organic foods for even lower prices, allowing you to get even more food for less! Abel and Cole vouchers are free and cost nothing to redeem (not even an email address is needed), so be sure to pick up yours to get the best price possible on all of the Abel and Cole offers!